I don’t know very much about Dyslexia, and as a teacher, I should. So I’ve asked my friend, Robin, for help. Robin is a mother of 4 boys, 2 of whom have dyslexia. She has been taking her sons to private tutoring and researching as much as she can about dyslexia for the past 7 years. As a Mom, nothing hurts more than to see your child struggling at school. As my first child entered Kindergarten, I had such high hopes for him. I would send him off each day with visions of him making new friends, learning about the world, and learning how to read. Unfortunately, that was not the reality for him. He struggled to complete his work before he could go outside for recess. He struggled to read. He complained of headaches when it was time for homework. And he even has a bit of trouble socializing with other kids. As time went on, reading became more and more difficult for him until I finally realized that it was my right as a parent to ask to have him tested. ADHD was my first thought since he would tap his pencil on the table and stood with one knee on his chair during homework time. I was wrong. He has dyslexia. Dyslexia manifests itself in so many different ways in different children. The only shared trait among dyslexics is that they all struggle to read at levels far below those of typical children of the same age. For him, the biggest challenge is his processing speed. 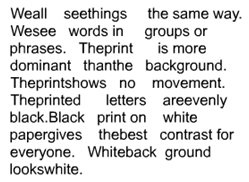 For others, it might be the reversal of letters or numbers. Many years later, and after thousands of dollars in private tutoring, I know that it is possible to learn to read with dyslexia. It takes dedicated teachers who are willing to be patient and specialize a program to help these children. Dyslexia, particularly in relation to processing speed, prevents students from moving information from the frontal cortex where learning occurs, to the storage area in the brain which allows them to recall words upon sight (like so many reading programs teach). For someone with dyslexia, a systematic multi-sensory kinesthetic approach is necessary. 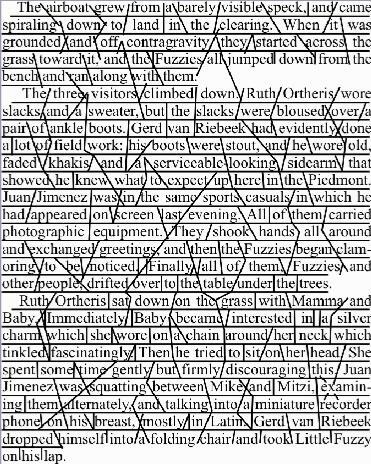 The rules of the English language MUST be taught so that a reader can decode a word every time he sees the word. This allows for only a small portion of the millions of words in our language to be put to memory – hence, sight words. Although dyslexia is a neurological difference, it does not affect intelligence. In fact, many kids with dyslexia test at average or higher than average intelligence. Einstein had dyslexia. The biggest problem I see as a parent of a child with dyslexia is lack of training and knowledge among our schools. So many teachers do not know how to teach a student with dyslexia so these children are simply put in special ed and given more time to be taught to read in a method that is not conducive to the way that a dyslexic learns to read. There are so many programs which are fairly inexpensive for teacher’s to use that are very effective. Discover Intensive Phonics by Reading Horizons is one of them. S.P.I.R.E. is another that is used by the private tutor I take my son to. It is a bit more expensive but still much less costly than many of the programs already being used in schools and special ed classes. There are also many kinesthetic approaches that are helpful for dyslexic students to train their brains to recognize words. My suggestion for teachers and administrators is to become more educated about dyslexia. Here are just a few facts that might impress education professionals of the importance of learning more. It is estimated that 70-80% of children with poor reading skills are dyslexic, many of whom are undiagnosed. One in every five students overall has dyslexia. Less than one third of students with reading disabilities are receiving school services to address those disabilities. Find out where the local chapter of the International Dyslexia Association meets in your area and attend their monthly meetings. They often have specialists visit to teach methods of helping these struggling children. Become more informed as a teacher so you can help keep these kids from falling through the cracks. You never know, some day it may one of your own children or grandchildren. Just for fun, click here to see one graphic designer’s take on dyslexia. 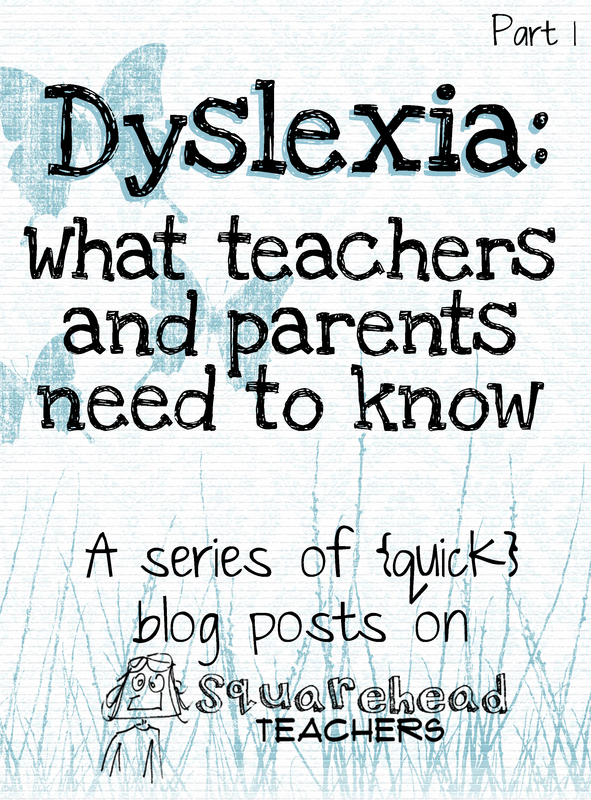 Stay tuned for more in our Dyslexia series (symptoms, tips & tricks for parents and teachers)! This entry was posted in ESL, Multicultural, Accommodations and tagged Children, dyslexia, Education, Elementary School, Homeschool, Kids, Reading, school, Teacher Resources, Teachers, Teaching by Squarehead Teachers. Bookmark the permalink. Very well stated. Unfortunately, it is difficult for teachers to use multi-sensory approaches in most schools-at least by us. They need more time and freedom with their lessons. As a homeschooling mom with dyslexia of a child with dyslexia, I know how difficult the job of teaching one child with dyslexia. Thank you for sharing this parents information. Thanks so much for browsing! I appreciate your insight!